It is all but certain that Apple’s next-generation pro portable line will feature a slim but not “ultra” skinny enclosure housing a Retina (i.e. pixel doubled or close thereto) display powered by Intel’s latest Ivy Bridge processors and supporting chips. The 17-inch model aside, which some folks believe will be cut, don’t expect an optical drive in the 13 and 15 models, except perhaps of the external variety with decidedly Apple price. And, yes, boys and girls, USB 3.0 should be among the bullet points, as well. That said, with online and brick n’ mortar retailers, like Best Buy, trimming Mac prices, new product could arrive anytime now, though the informed speculation has the MacBook Pro arriving manna like from Cupertino (a.k.a. heaven) in the June timeframe. Of course, speculation centers on Apple’s annual Worldwide Developer Conference, which runs from June 11 through the 15th. and paste in OS X Mountain Lion’s default desktop picture and… ‘voila’? What’s that all about? AnandTech has the dish on the GeForce GT 650M. But be forewarned, their write up is very bandwidth intensive. 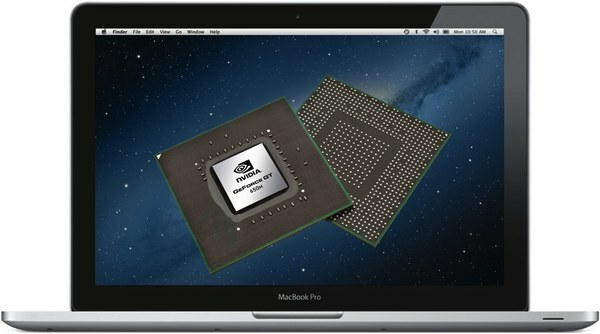 One would expect that this year’s 15 and 17 inch MacBook Pros will use Intel integrated graphics for less intensive, low-power tasks and switch to the GT 650M for the heavy lifting, such as gaming, image editing, etc. Again, if past is prologue, then the entry-level 13-inch models will ship only with Intel graphics as well as updated MacBook Air models, which are likewise expected in June.